What is a class like at Play with Pigments? Our classes are a stress-free group setting where an artist guide guests, step-by-step, through replicating a featured painting. Each class works on a specific painting, but guests are encouraged to explore their creativity and go off on their own, if they wish to. We provide all of the art supplies required for the class, including brushes, easels, paints, canvases, etc. As part of the class, you will learn color mixing, brush techniques, and basic art theory… all while having fun! You will go home with a painting that you are proud of! The classes start at a set time, so we suggest that patrons arrive a few minutes early to select a seat as well as to pour a drink. Classes last approximately 2 to 3 hours with frequent sip breaks. What if I'm not an artist or a painter? While guests will learn how to create a painting that they will be proud of, the focus is on fun and having a unique night out. During the class we’re playing fun music while guests have the opportunity to enjoy their own beverages and snacks, as well as a chance to socialize with dates, friends or significant others. Seating for our public events are competitive, so we highly recommend signing up in advance. The easiest way to register is to purchase tickets online by going to our calendar page. You will be able to view the featured painting for each class, and thus choose the painting that you want to paint. We do take cash and credit card payments on site if seating is available, but there is a $5 upcharge for tickets at the door. Furthermore, we can NOT guarantee that there will still be a spot available for you, so early registration is HIGHLY encouraged! What is the cost of a paint class? As a general rule of thumb, a 2 hour class will be about $35.00 and a 3 hours class will be approximately $45.00. There are also specialty classes that might have a different price and those will be noted at the event information on our Calendar for each specific event. We also run FUNdraisers for various charity organizations. These classes are usually open to the public, and might have a slightly higher cost as compared to our regular events. We gift a percentage of all revenue from FUNdraiser events to the featured charity, but we also offer them the option of increasing the base cost to encourage higher donations. If you would like to host a FUNdraiser, please let us know! 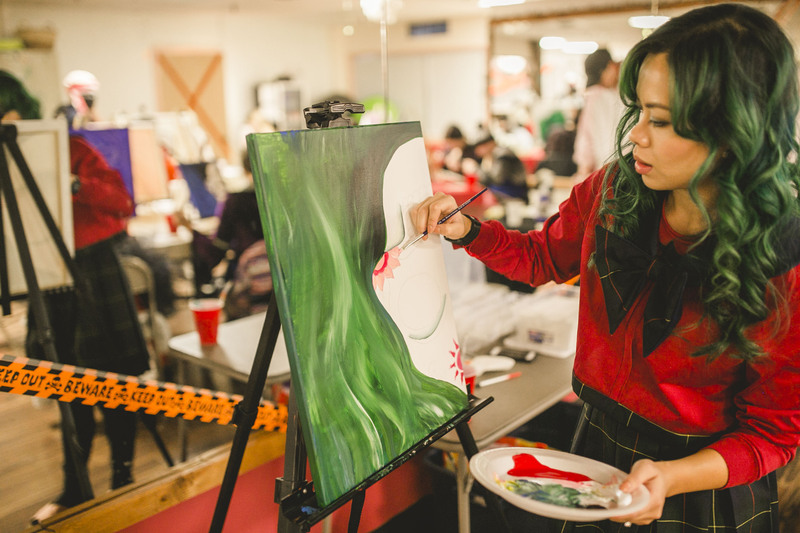 We provide everything you will need for your class, including: a 16″ x 20″ canvas, paint, brushes, easels, aprons, music, and a talented instructor to host the evening. In most cases, you are encouraged to bring wine or a beverage and snack of choice as we will not have any food or drinks for sale. We also have wine screws, bottle openers, and paper cups available for your drinks. What is the age limit? Can my child attend the public class with me? As a general rule of thumb, our minimum age is 21 and over for parties with alcohol involved, although we will allow 18+ to attend if they are with are accompanied by someone 21 years old or older. We do not tolerate under-age drinking under any circumstances, and participation in that sort of activity will result in immediate dismissal of the perpetrator, and everyone in their group, from the event. Almost all of our classes are themed for an adult audience, with mature humor. We do occasionally offer all ages themed events so that children and teenagers can attend with their adult in an alcohol free environment. These events will be clearly marked in the event description. What time should I arrive for an event? We recommend getting there 15 -30 minutes prior to the class to get registered and get situated/pour a drink. Classes start promptly and patrons will need a few minutes to get settled. If you are coming with a group, please make sure at least one person shows up early to stake out a table or group of chairs. We do not offer advanced seating requests, as they have historically created havoc with our ability to get the class started on time, so please plan accordingly! Due to our circumstance, we cannot not offer refunds, exchanges or reschedules, no exceptions. So if you absolutely cannot attend, we recommend finding a substitute who will attend in place of you. Please notify us of the change via our contact form. Be sure to include your name, your substitute’s name and order number. We are sorry, but we cannot give refunds for ‘no shows’ as we have already purchased supplies and arranged for staff. Thank you in advance for respect of our reservation policy. Note: Play with Pigments reserves the right to cancel a painting session at any time due to class size, weather, sickness, etc. If we feel we need to cancel a painting session, every attempt will be made to notify those that have signed up for session by phone and email (so make sure your information is correct). Patrons will be given the option of rescheduling their session or a refund will be made in this case. We do not provide alcohol or food but you are welcome to bring your own beverages and light snacks. For special themed parties, we may arrange to have some food and beverages available, but we will note that in the event description. I plan on attending with a friend, or a group of friends. Can we all sit together? We always try to seat friends and parties together, but make sure at least ONE person from your party arrives early to “stake out” an area for you. If you would like to sit with a friend who purchased tickets separately, please notify us via email at least 24 hours in advance. We will do our best to accommodate your party, however we cannot guarantee your request if circumstances do not allow. Can I host a private paint party with Play with Pigments? Yes! Check out the Private Events page for further details. Can I make my own changes to the featured painting during class? Absolutely! Our guests are welcome to change up their unique art piece, and we have seen some absolutely incredible interpretations! Our instructors will be there to answer any questions and provide some advice, but their primary obligation is to teach the featured painting to the rest of the class, so please be considerate of the other patrons.